The Brightspace (D2L) homepage is the landing page for Brightspace (D2L). All users first see this page when they log into Brightspace (D2L), and users can return to the homepage any time by clicking “My Home” at at the top of their screen. The page is comprised of a number of “widgets” – boxes that provide easy access to course information and resources. Campus-wide news is also displayed on this page. Each course that you are registered for will also have its own homepage. You can navigate to your course using the course selector in the mini bar anchored to the top of your screen, or by selecting your course from the “My Courses” widget on the Brightspace (D2L) homepage. 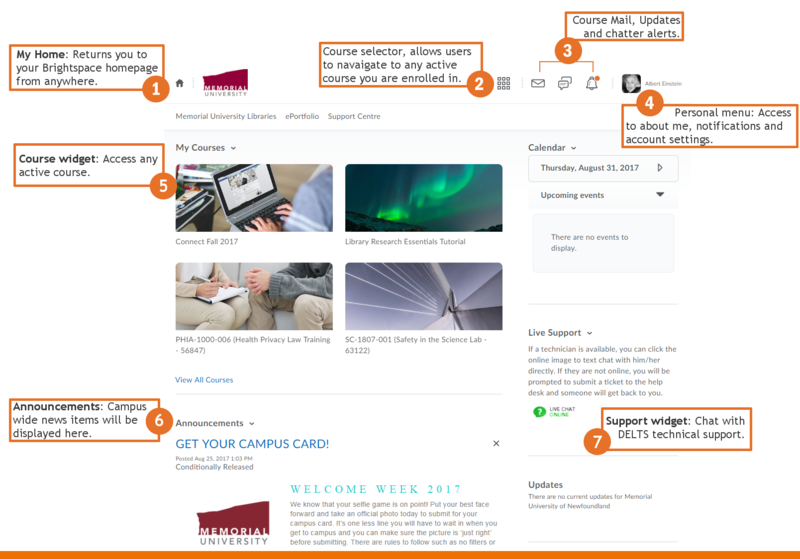 Your individual course homepages will likely look similar to the Brightspace (D2L) homepage, but will contain information specific to that course.